Dr. Lloyd Axworthy served as President and Vice-Chancellor of the University of Winnipeg from 2004-2014. Before that, Dr. Axworthy’s political career spanned 27 years, six of which he served in the Manitoba Legislative Assembly and 21 in the Federal Parliament. He held several Cabinet positions, most notably Minister of Foreign Affairs from 1996-2000. He became internationally known for his advancement of the human security concept, in particular, the Ottawa Treaty – a landmark global treaty banning anti-personnel landmines. For his leadership on landmines, Dr. Axworthy was nominated for the Nobel Peace Prize. For his efforts in establishing the International Criminal Court and the Protocol on child soldiers, he received the North-South Prize of the Council of Europe. He has been a board member for a number of organizations, including the MacArthur Foundation, the Conference Board of Canada, the Aspen Ministers Forum and the Coalition for the International Criminal Court. He has received honorary doctorates from 12 universities. 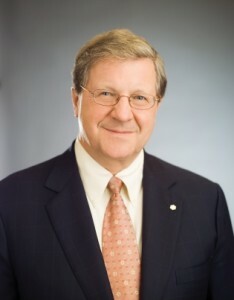 Mr. Axworthy is currently chair of the board of CUSO, chancellor of St Paul’s University College, a board member of the International Institute of Sustainable Development, member of The Hague Institute Commission on Governance and Security, and the American Academy Working Group on the Ethics of the New Technologies of War and Peace. "Landmines are among the most barbaric weapons of war, because they continue to kill and maim innocent people long after the war itself has ended. Also, fear of them keeps people off the land, and thus prevents them from growing food."